An Office 365 subscription for Education that includes OneDrive for Business. If you're not sure you have this, please contact your IT administrator to verify. An organizational account for yourself (the teacher) with permissions to use the OneNote Class Notebook app to create the class notebooks. Your students must have an Office 365 organizational account. We recommend Internet Explorer 10 or Internet Explorer 11 to use the OneNote Class Notebook app. Other modern browsers should also work. Click the app launcher in the upper left. In the list of apps that appears, click the Class Notebook app. Click Create a class notebook from the available options. Name your new notebook, and then click Next. TIP: We recommend that you create a separate notebook for each class. For example, if you teach multiple Spanish 2 classes, create a notebook for each class. Give each notebook a unique name that is easy for you and your students to identify. You might name the notebooks “Spanish 2 P1” for your 1st period class, “Spanish 2 P2” for your 2nd period class, and so on. NOTE: Each notebook you create must have a unique name, and it cannot contain these characters # / * ? " | < > : . % ' \. 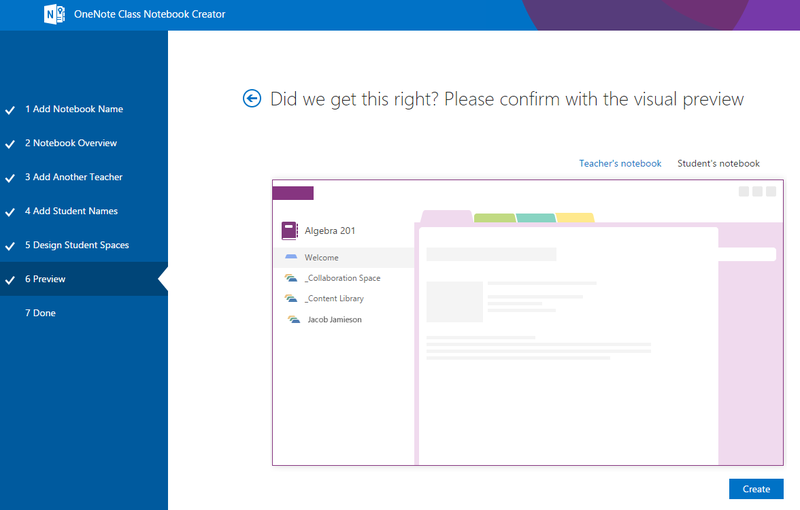 On this screen, you have the option to add another teacher to your class notebook. Any teacher added will have the same permissions as you do. You can add as many as you'd like. Enter the name(s) of the teacher and click Next. You can add students to your class notebook by adding them individually, by pasting a list of students or by adding group aliases. The Class Notebook app now supports Active Directory Security groups and Modern Groups. Each student receives their own private section and gets access to the collaboration sections. NOTE: Currently, we don't support distribution lists or SharePoint groups. If you aren't able to add certain student groups to your class notebook, please contact your IT admin to set them up as AD Security Groups or Modern Groups. NOTE: Your students must have an Office 365 organization account to continue with this step. If you aren't sure whether or not they do, ask your IT Administrator. 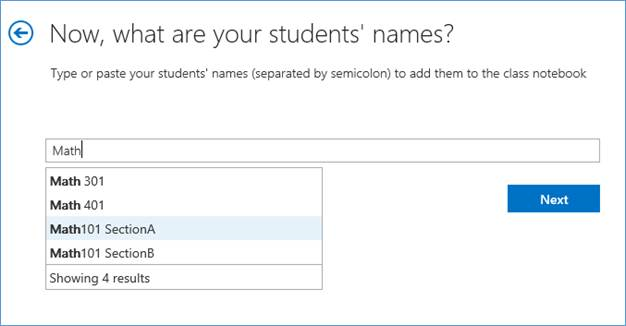 To add students individually, simply type their names in the text box and then press Enter. As you type, the app will look up possible matches. For example, you can type “Jacob” and it will find any students matching that name. TIP: As you type, the app will look up possible matches. For example, you can type “Jacob” and it will find any students matching that name. You can add groups in the same manner as adding students. Simply type the name of the group; the app will show you suggestions from which you can select the group you would like to add. To add individual students in bulk, you can copy-paste a list of student as shown below. After you paste the students' names into the text box, the app will look up each name. The app may take a few moments to automatically resolve each name. For each match that isn't found, you can retype the name or remove the name from the text box. Click Next after you've added all of your students and groups. Keep the boxes checked next to the default sections that you'd like created in each student’s notebook. Click Add more to add additional sections in each student’s notebook. TIP: We recommend that you create section names that correspond to activities, not units. For example, use activities such as Handouts, Class Notes, and Quizzes. The reason for this is that students work in one unit at a time; it will take longer to find items of interest in a unit section. NOTE: You can also add, remove, and delete sections directly in your students’ notebooks after the class notebook is created. Click Teacher's notebook, and Student's notebook to verify how the sub-notebooks and sections will be created for the class. Click to go back to add or remove sections, or click Create to have the app create your class notebook. 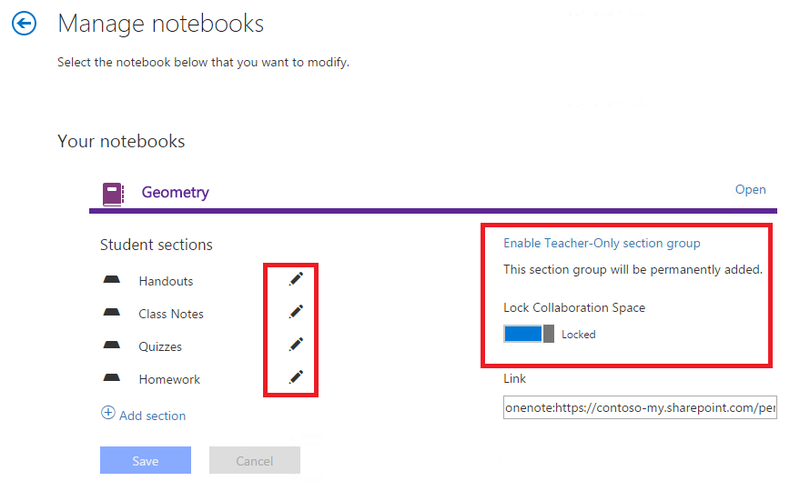 Click the notebook name link to open your class notebook in OneNote. As soon as the notebook is ready for your students, email the hyperlink shown in the text box to your class for your students to open. 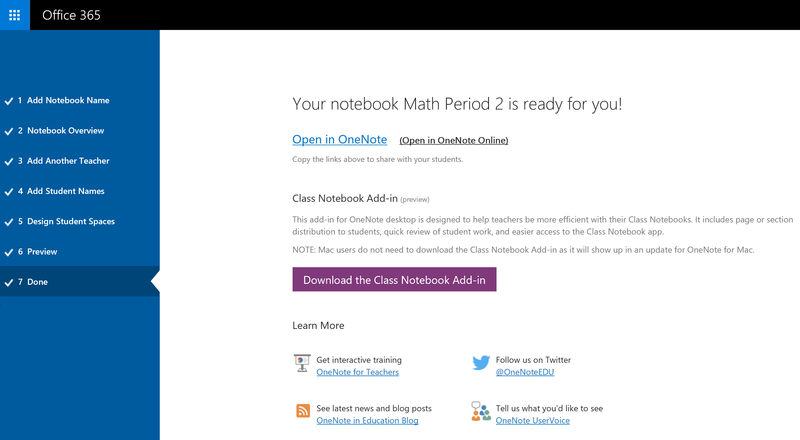 Keep a copy of this link for your records or retrieve this link later in OneNote 2013 by right-clicking the class notebook in the notebook list, and then clicking Copy Link to Notebook. TIP: The same link is used by everyone in one class to access the class notebook. If you make notebooks for several classes, each link will be different. TIP: You may want to add content by placing it in the Content Library before inviting your students to open the class notebook. Keep a copy of the link in your records while you prepare the notebook, then share the link with the students when ready. To manage other capabilities for your Class Notebooks, click the Manage notebooks button. This displays a page that shows all class notebooks created by you, as well as information for customizing each one. Renaming student sections — To rename any student sections, click the little pencil icon, and then type the new name of the section. Be sure to click Save after renaming student sections. Adding student sections — To distribute a new section to all students, click the Add section button. Be sure to click Save after adding student sections. Enabling the Teacher-Only section group — The Teacher-Only section group is a private space where only the teacher can see what’s inside. To add a Teacher Only section group to your Class Notebook, click Enable Teacher-Only section group. Other teachers that have access to your Class Notebook will also have access to the Teacher-Only section group, but students cannot see anything here. Locking the Collaboration Space — Enabling this option changes the Collaboration Space to read-only (or lockdown) to prevent any students from editing. You can toggle the switch from locked to unlocked at any time. Opening the Class Notebook — Click Open to open the Class Notebook. Sharing a link to the Class Notebook — To send a link to the Class Notebook to your class, select and copy the text in the Link box, and then paste it into an email. 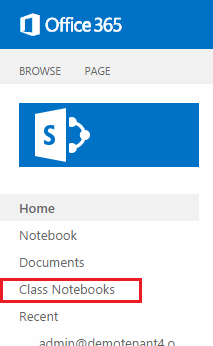 Students can find all new class notebooks on their OneDrive for Business inside the Shared with me folder. For class notebooks created on a class SharePoint site, students can find all of their class notebooks by going to the Class notebooks entry in the Quick Launch navigation pane for SharePoint on the left side of the screen.